Leaflets can be one of the most economical, flexible and effective ways of promoting your company. We can design and print leaflets from A6 to A4 in size both single or double sided, in full or single colour, with print runs from ten up to many thousands. If necessary, we can even arrange the printing of non standard sizes for highly specialised projects. If your printing requirements are more complicated, we are ideally placed to offer expert advice and assistance in the design concept and print of brochures and booklets. 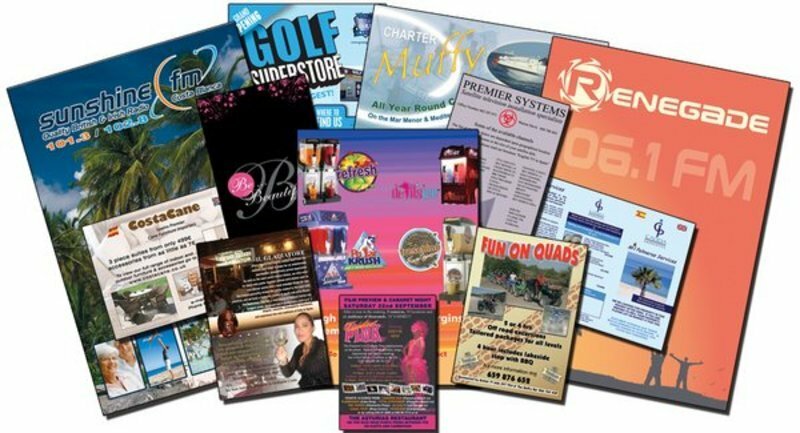 Whether small A5 booklets, A4 brochures or custom-made to your own sizing needs, we will ensure that your business is promoted in the most efficient and cost effective manner. Every restaurant and bar that provides food for its customers needs a menu, and we have a range of styles, sizes and finishes to suit every type of catering outlet. We can also produce special one off promotional menus as well as having them printed on canvas or vinyl for large scale display purposes. We do supply menus to many of the finest restaurants in Orihuela Costa, including Eduardos, Fairways, Puccinis, Italian Affair, Alejandros, Il Gladiatore, Copacabana, Papaya Tree to name but a few. So, if you own a restaurant and are looking at changing your menu, let us Print redesign it for you.